Magyar, Polski, Română, Español, Svenska, Türkçe. 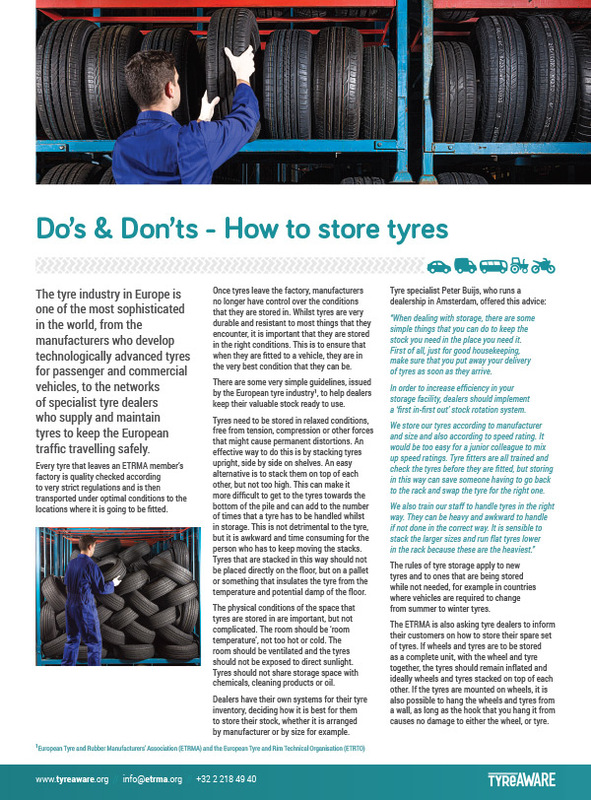 Hear the best practice tips and advice from an industry expert on tyre storage and handling. These very simple guidelines will help dealers keep their valuable stock ready to use. 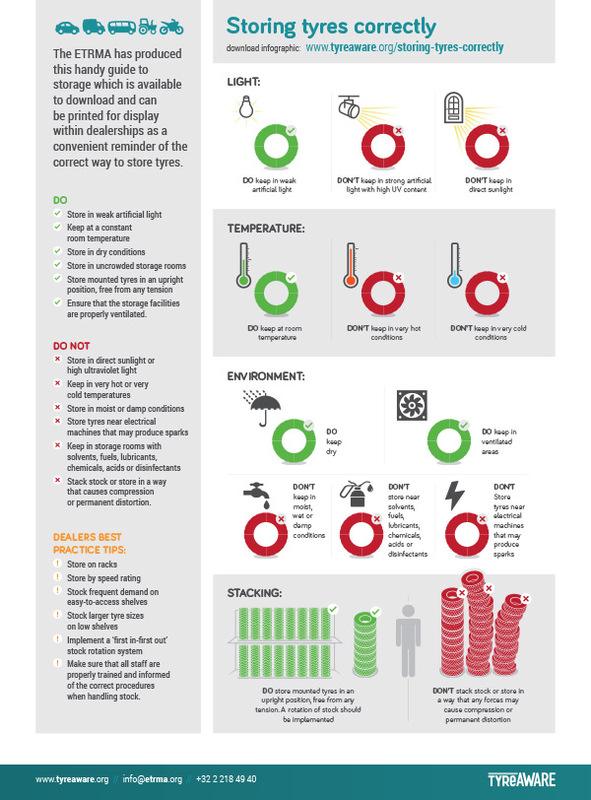 This handy visual guide will serve as a convenient reminder for dealerships on the correct way to store tyres. 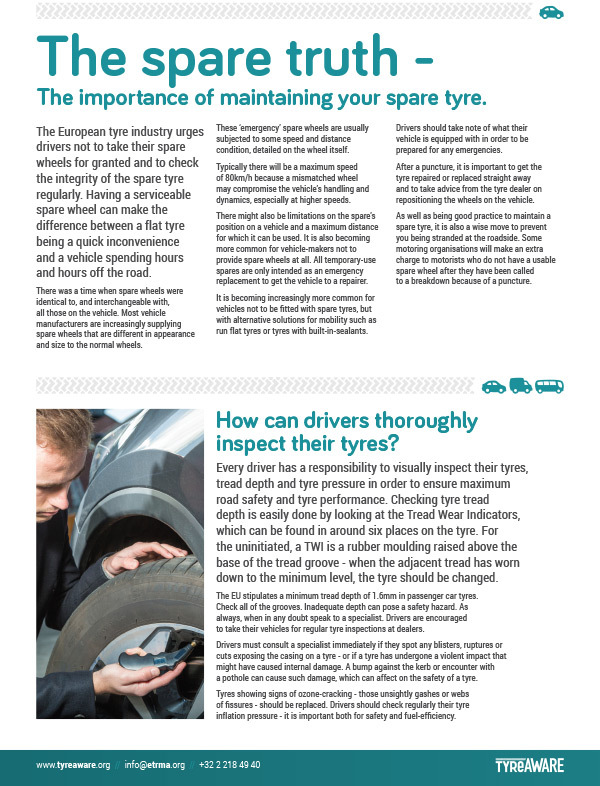 Learn about the various ways to stack tyres and what environmental conditions should be avoided. 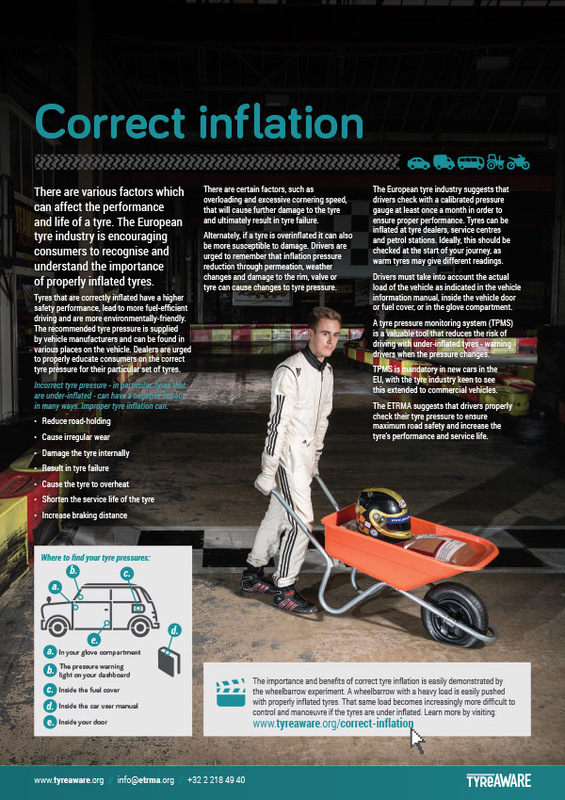 The importance and benefits of correct tyre inflation is demonstrated through this wheelbarrow experiment. A wheelbarrow with a heavy load is easily pushed with properly inflated tyres. That same load becomes increasingly more difficult to control and manoeuvre if the tyres are under inflated. 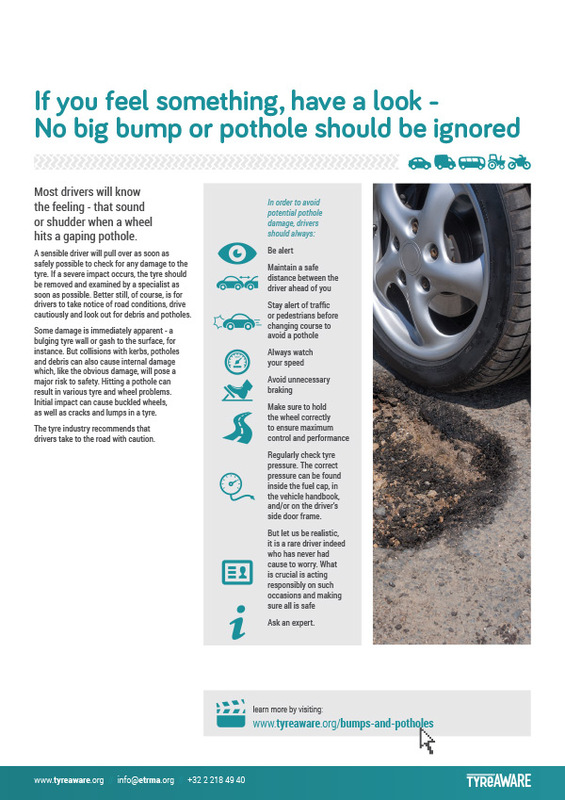 Potholes are becoming an increasing issue across Europe, so taking care on the road and exercising safe and careful driving is essential. This video gives the tyre industry’s driving recommendations in order to avoid potential pothole damage. Across Europe, winter conditions are being addressed with increasing attention locally. With plunging temperatures, heavy snowfall and icy roads, there is an increasing demand for drivers to switch to winter tyres. 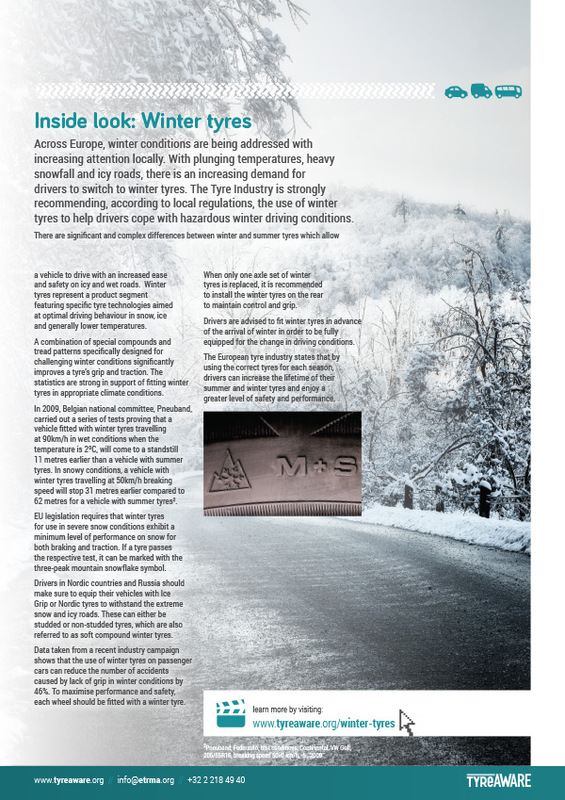 Here you can learn all you need to know about winter tyres. The European tyre industry urges drivers not to take their spare wheel for granted and to check the integrity of the spare tyre or whatever extended mobility solution your vehicle is equipped with regularly. This video will tell you the truth about maintaining your spare tyre. When purchasing a set of tyres, it is very important to understand all of the facts before you purchase. This video will give you an in depth look at making at choosing the right set of tyres for your vehicle. Every driver has a responsibility to visually inspect their tyres in order ensure safety and maximize your driving experience. 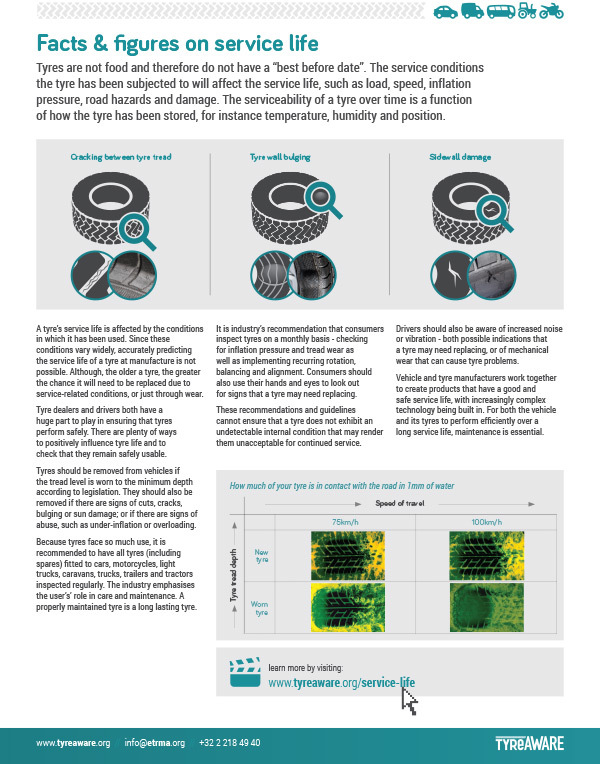 Learn more about how you can visually inspect your tyres and what tools are needed to make for a more enjoyable and safe driving experience. 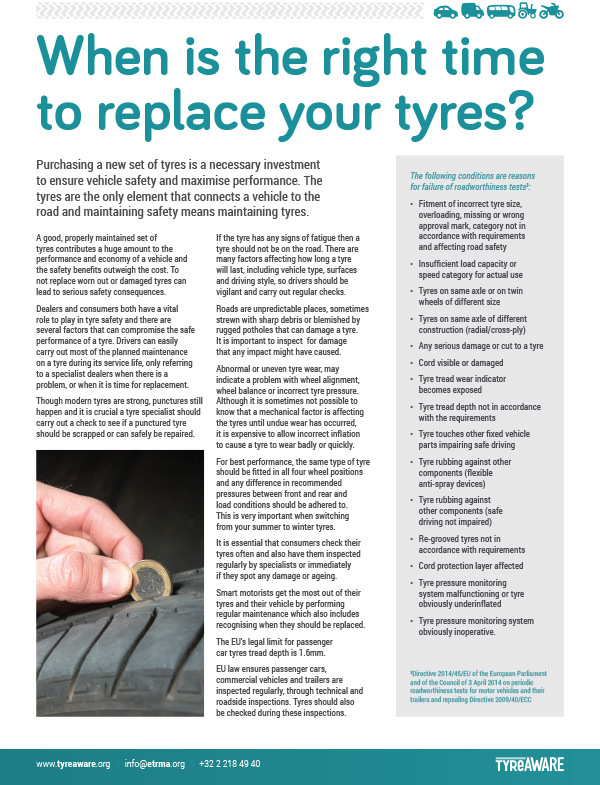 There are many factors that can determine when is is the right time to replace your tyres. Learn more about the tyre industry’s recommendations to ensure vehicle safety and maximize performance. 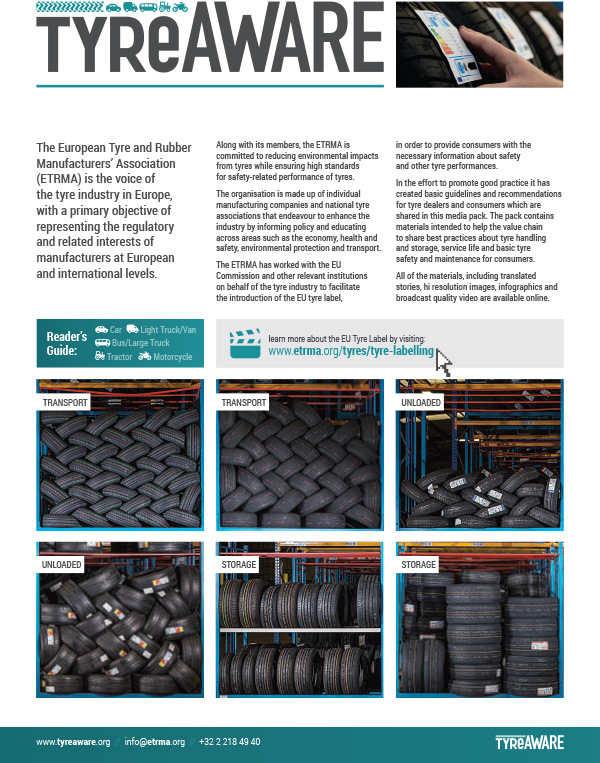 The ETRMA is the voice of the tyre industry in Europe, with a primary objective of representing the regulatory and related interests of manufacturers at European and international levels. The tyre industry in Europe is one of the most sophisticated in the world. Along with its members, the ETRMA is committed to reducing environmental impacts from tyres while ensuring high standards for safety-related performance. 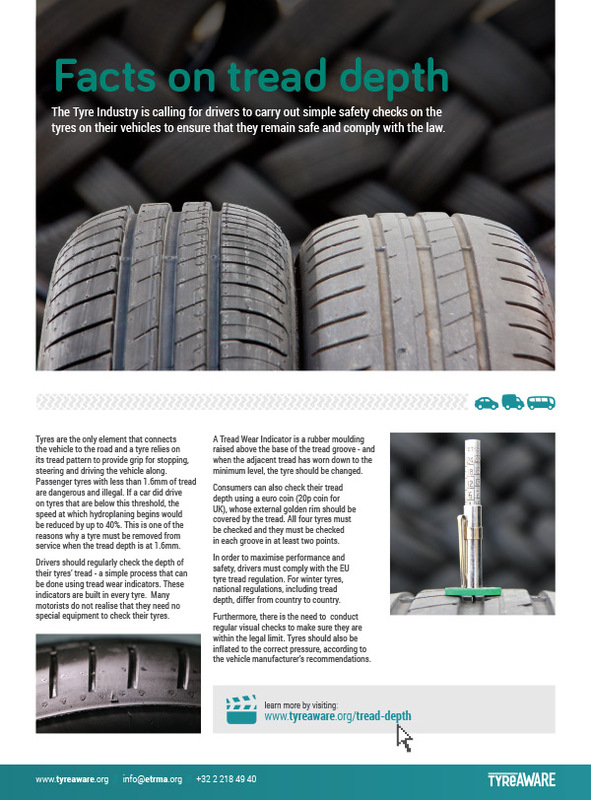 Here you can learn more about the ETRMA members and how a tyre goes from rubber to road.